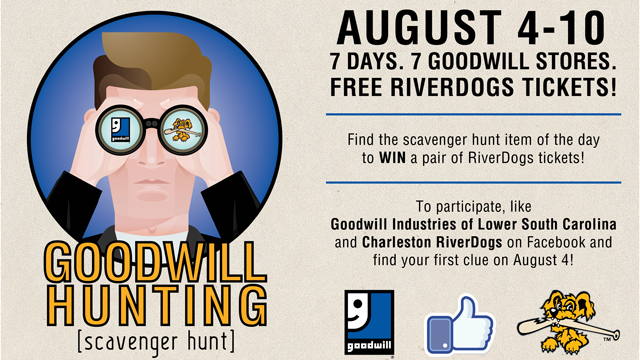 The Charleston RiverDogs and Palmetto Goodwill have teamed up to host Goodwill Hunting, a tri-county scavenger hunt that runs Monday, August 4 through Sunday, August 10 at select Goodwill stores. Participants can win tickets to a RiverDogs game at Joseph P. Riley, Jr. Park and a chance to win a daily prize pack. Starting August 4, scavenger hunt items will be placed in select Goodwill retail stores in Berkeley, Dorchester and Charleston counties. Clues leading to the Goodwill store where the item is located and a picture of each day’s Goodwill Hunting item will be released on the Palmetto Goodwill and Charleston RiverDogs Facebook pages daily starting at 9 am. Once fans visit the correct Goodwill store and locate that day’s item, they should snap a picture with their cell phone and show the picture at checkout. If they do not have a cell phone, they can identify the Goodwill Hunting code on the item and let the cashier know the code at checkout. In return they will receive two tickets to a RiverDogs home game. If the participant uploads the photo to Facebook and tags Palmetto Goodwill and the RiverDogs, he or she is automatically entered into a drawing for a daily prize pack. Daily grand prizes include gift certificates to Joe Pasta, Triangle Char & Bar, McDonald’s, Brixx Pizza, Bootjack, Monster Music & Movies, Shem Creek Bar & Grill, CDs and more. There is no purchase necessary to play, but participants must follow Palmetto Goodwill and the Charleston RiverDogs on Facebook.